The first golden rule is to ensure that you buy a bike that fits your child properly. The second golden rule is to buy the best children’s bike you can. It also needs to be suitable for their abilities so try to avoid getting something that they will grow into. At Hoy bikes we’re motivated by always remembering how riding a bike is a special part of childhood, so our bikes make that experience more enjoyable for children and offer the most value and reward for parents. The Meadowmill is a perfect all-round ride for a young rider gripped by the thrills of fast bikes. It’s named after the cyclo-cross circuit that Sir Chris Hoy raced at early in his career but it’s not only a cyclo-cross bike, it makes a fine road bike and it’s happy on the bridleways and quiet tracks that make up any young explorer’s ride. 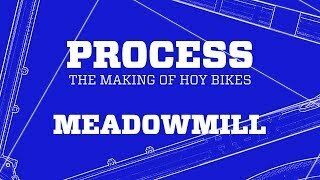 Understanding that a child’s bike is a much greater percentage of their own weight than an adult’s bike is, we reduced the weight of the redesigned Meadowmill wherever we could. New frame tubing dimensions, lower-weight components, size-specific narrower cranks that put the feet closer together and mean no overstretched legs, we even developed foam padding for the saddle which saved weight and improved comfort – and all this time spent on making our best-fitting and lightest ever children’s bikes is justified when you see the difference it makes. More miles, more smiles, more energy burned off, it’s all worth it! Small drop bars, a micro-size gear shifter and single chainrings mean maximum control when keen juniors go for speed and see what both themselves and the Meadowmill 24 are capable of! An excellent road and off road bike for my 10 year old son. He easily completed his first 10 mile ride on closed roads and trails, had no problems with the gears and seemed very comfortable throughout. I expect this will last him for a couple of years before he required a bigger frame. Choosing the bike size depends on the type of bike, your height, your riding style, and your preference. A correct fitting bike will be more comfortable, more efficient and more fun to ride. This bike size guide gives our customers general advice on choosing the right size. It is a guide only and we always recommend visiting one of our stores or contacting one of our experts.